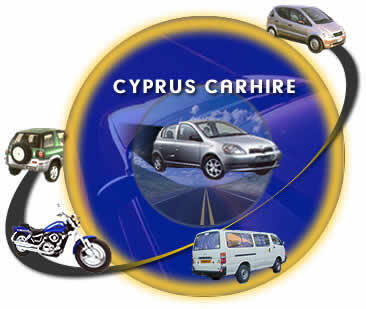 Cyprus car hire, car rental, mini bus, motorbikes, scooters, cycles, Harleys and transport options. Here you will find information about hiring cars, minibuses and renting motor bikes cycles and touring bikes in Cyprus for holiday rentals as well as business and fly drive car rentals. If you need a vehicle we will get it for you. We also have coach trips, motability rescal scooters as well as airport transfers, from Larnaca and Paphos airports, coaches, sightseeing and motorbike hire including Harleys. We are not a car hire agency or travel agent , we are not Hertz or Budget or Astra National or Avis or Sixt, Petsas or Thames but we work together with a selection of what we consider to be the best of these and will find you the type of car you want, at a fair price. We try hard to give good service, we sort out any problems you may encounter whilst here and have a 24hr support service. We are often used in conjunction with Cyprus-villas and Cyprus-Hotels as well as A Window on cyprus and we combine value with service. If you want us to arrange transport hire of any nature for yourself or or others, including wedding cars please check our lists and decide what type of vehicle you are interested in, then fill in this form or e mail us and we will check availability and let you know your options prior to booking. It will cost you no more than booking direct on arrival, and you do not pay a penny until you have inspected the car. We deliver the service we offer. Answer of all queries is guaranteed within 24 hrs maximum on working days. Our insurance packages now include CDW (Collision damage waiver) as standard as well as comprehensive insurance. We have no hidden extras, we include the VAT in our pricing, what we quote is what you pay. There are many car hire companies out there who will quote a price which sounds too good to be true. It usually is. When you get to the airport, you will find that the extras are then piled on, % pounds for CDW, 15% vat, extra driver charges and if they can get away with it, standard insurance which here they call comprehensive. (It isn't, it is equivalent to 3rd part, fire and theft, although theft is not an option! ) We offer our clients free upgrades wherever possible and often have special offers for repeat clients, especially if you are a member of the Armata club. We also cover the towns of Nicosia (Lefkosia) Limassol (Lemessos) Larnaca (Larnaka) Ayia Napa (Agia napa) Protaras, Polis, Paphos (Pafos or Pathos even), Latchi and the Troodos range. We deliver to your hotel or you can pick up at Larnaca or Paphos airport if you prefer. It is also possible to receive your car at your hotel and then leave it at the airport on your way out. We do a range of 7 seater and 4x4 cars and would advise you that in the summer and peak holiday periods availability is very limited - this is not a sales ploy - we really do have to turn away too many last minute requests in the high season - please do book early for those categories as it is heartbreaking when people staying in an isolated village have no transport for the whole of a 2 week holiday just because they didn't book early enough, you don't pay until you arrive and see the car so you have nothing to lose, we only ask if you find you are not travelling on the day you should be, please let us know. The second week of July & August as well as often in October air conditioned cars are fully booked throughout Cyprus. We have a 24 hour support line, this is not a booking line, so please don't call at 3 am to book a car, but if you have a problem with your car at 3am, please call us and we will help you. Car hire in Cyprus - a rental service without parallel. Copyright 1998 - 2019 Armata. All rights reserved.